Assisted Opening Out the Front Knife. This knife from Schrade features an exciting out-the-front mechanism. Simply push on the slider near the base of the blade to get the blade moving. Once you reach a certain point the knife takes over and rockets the blade out and into place. Lock-up is very solid on this knife. To retract the blade, just pull down on the slider and lock it back into place (automatic ejection, manual retraction). The stainless blade is coated with titanium nitride. 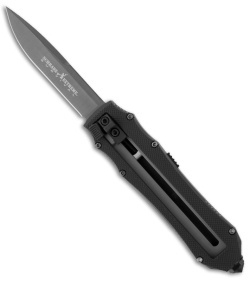 The black Zytel handles provide maximum strength with minimum weight (check out the specs below- this is a very light knife). 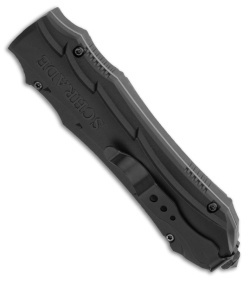 Sliding safety, pocket clip and glass breaker are all present for your convenience.